At our dealership in Freehold, NJ, we want to make sure you are always receiving the best for your vehicle. Our service team is made up of factory-trained technicians that only use genuine OEM parts to make sure your vehicle will always be reliable. 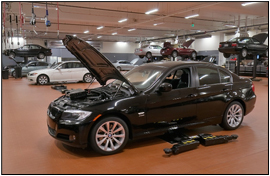 Our state-of-the-art service center provides our expert technicians with all of the tools that they will need to do any work that you might need for your BMW model. We want to make the process as easy as it can be, which is why we offer the BMW Ultimate Service Plan to help you keep your new BMW running its best. If your vehicle doesn't qualify for this plan, we still provide the most competitive price thanks to our BMW Value Service for your model. Routine maintenance is a guaranteed way to make sure your vehicle can be in the best condition throughout your time of ownership. Things like brake repair, fluid replacement, oil changes, engine diagnostics, battery replacement, tire rotations, and more will do the preventative work to ensure that you don't encounter a larger problem. If you should need a more in-depth repair, our skilled team is more than qualified to get it done. We want to make it as easy as possible for customers around Old Bridge and Howell to keep their vehicle in the best condition possible. Our team can help you with anything that your BMW might need; our service specials help to keep some of the most popular reasons for an appointment as competitively priced as possible. If you are looking for an oil change near Toms River, or if you need exhaust work near Jackson, NJ, we are here to help. We encourage you to visit us soon so that we can get you started!